The Spinner Aero has been designed for use in the home with the features of the commercial Spinner NXT. It is described as being for the serious road cyclist for use in indoor training. It has some great features to help with this – a best in class in Q Factor, easy to adjust resistance, an external weighted flywheel and adjustable seat and handlebars. It definitely has the features to be a great spin bike for getting some tough indoor training and spinning workouts as well as for more moderate exercise for keeping active or for helping with weight loss. In our review we look at these features but also how it is for the different considerations for home use that are different to gym – such as it being used in shared use space and ohow impacts on the lives of others in the home. So, first up how does it hold up to being used. The steel frame holds the bike steady and has been designed to be solid and durable for lasting use. This does enable you to just concentrate on your workout and not be concerned about the bike moving or wobbling while you pedal hard against the resistance in or out of the seat or moving in between. To prevent the seat and handlebars from shaking the head tubes are oval shaped. When tightened up this gives a more secure fit to prevent any shaking at any level of intensity. The external weighted flywheel weighs 43 lbs. This gives it good inertia to help in pulling the pedal through a full 360 degree cycle. It prevents slowing down of pedals at the bottom and top of the cycle. Without this the pedal stroke can be choppy and more of an up and down motion that adds some impact to the workout dealing with the changing speed, isn’t efficient and not like you experience on an outdoor bike. Underneath the stabilizer bars are levelers that can be used to level the bike to prevent any rocking that might otherwise occur due to variations in the floor surface. The handlebars and seat positions are fully adjustable vertically and horizontally. You can move them to exactly the place you want. To move them fore/aft you loosen the lever and slide them into position and tighten up. For vertical adjustment you loosen the pop-pin knob, pull it out and slide the pole into position and tighten up. There is a scale marked on the pole to help in returning a bike to a previous setting (if it has been changed). The bike is designed to be used by people of different sizes between 4 ft 10 ins and 6 ft 8 ins. The setting and re-setting the bike is quick making it able to be used by different people in a family. It can be used by people of different abilities too, making it something everyone can use to get low impact cardio training and exercise. The adjustability of the bike makes it easy to get it to fit you so you can ride in the best position for workouts and/or set it up so it is set close to your road bike for indoor training. The bike uses friction to provide the resistance for hill climb training. It has a single friction pad that sits on the top of flywheel providing constant and consistent resistance. The resistance is increased and decreased by turning the tension knob at the front of the frame. It has a rubberized coating that makes it easy to grip and turn when your hands are sweaty. It does go up incrementally from nothing to very hard. 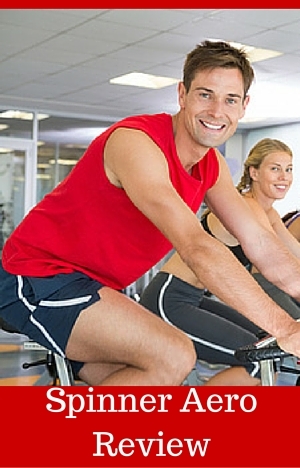 You may find you don’t need to turn it as far as you do on a gym bike. The resistance still goes up in small enough to adjust it to the setting you want. It doesn’t go from easy to impossible with just one small turn. As with most spin bikes you don’t have resistance levels marked which can make it difficult to return to a previous setting or to know how hard you are working compared to a previous workout. The only spin bikes or indoor cycles with marked resistance have magnetic resistance and cost about $600 to $900 more – Keiser M3 Plus or Bodycraft SPR but they have a different set up than a traditional spin bike which is not everyone’s taste (others prefer it). There is a guard that protects the resistance pad and flywheel from sweat dripping on to them. This helps to prolong the life of both as they don’t get exposed to the corrosive effects of sweat. The bike has a chain drive that is similar to the one you find on an outdoor bike. It makes a soft clinking noise as it moves over the sprockets. It shouldn’t rattle. If it does the chain may need tightening. You do this in the similar way you do on an outdoor bike. Most people should find they can do this. The use of chain is for this reason is to make the riding experience as close as possible to riding an outdoor bike but it does come with the same maintenance requirements – of correct tension and lubricating as required. Overall there should be less as it is being used inside and only needs to be done as needed – which is not very often. The bike has a fixed gear. When the flywheel is turning the pedals will turn too. The fixed gear helps in bringing the pedals through to feel like a road bike, it also keeps you feet turning to get more out of a workout. It does make getting off the bike a little difficult. To do this you need to either slowly stop the pedals with your feet or press down hard on the resistance knob to use it as a brake. This is the normal arrangement for spin bikes. The bike comes with dual sided pedals . One side has toe baskets and straps for fitting ordinary shoes. The other side takes SPD shoes. You can get a good grip with either side of the pedal for riding standing up or seated without your feet slipping off. This bike has one of the best Q Factors for a spin bike at 155 mm (the horizontal distance between the inside of the pedals). This brings it close to a road bike. Your feet will be more in align with your hips that will mean a more comfortable ride and less stress on your legs and a more efficient workout. Noise. The bike is quiet but not silent. You are going to hear the chain going over the sprockets like you do on an outdoor bike and the resistance pad rubbing on the flywheel. Neither are loud and you shouldn’t disturb others in the house or your neighbors if you are in an apartment. If noise is going to be an issue quieter bikes have magnetic resistance and belt drive which are very quiet but they do cost more and provide a different riding experience. At this price range is the Sole SB900 with a 48 lbs weighted flywheel but doesn’t come with workout DVDs. Dust and Dirt. It doesn’t give off that much dirt and dust but there is some. There is lubricant from the chain and dust from the resistance pad as it wears down. There is likely to be sweat generate from the exertion. This will drip on the bike and on the floor. The bike has been designed to guard against the effects of this to prevent it accumulating but it does need to be cleaned to keep it looking good and performing well – it doesn’t need a lot. The floor can be protected with a rubber exercise mat. The bike has 2 transport wheels at the front of the bike that you tip the bike onto when you want to move it. They take most of the weight leaving you with job of pushing and pulling it into place. The wheels are far enough apart so it won’t tip over easily. However you do need to be careful not to overbalance the bike – it is something to be aware of as you move it. When it is not in use the bike needs an area of 20 ins by 55 ins. It is longer than other spin bikes but should also be able to be stored out of the way when not in use. It should continue to look good for a number of years so won’t be too horrible to look at if you can’t move it out of the way – if you’ve got a home gym this won’t be issue. For shipping purposes the bike is only partly assembled leaving you to complete the job. Most people find they can put spin bikes together in an hour. Most of the job has been done and there are only a few parts that need to be fitted. The stabilizer bars, adjustment poles, seat, handlebars, levers and pedals need to be added to the bike. The tools required to do this are included. The instructions are clear and easy to follow. It seems to have been well machined so everything fits and the holes line up. For most people the hardest part of the process is the weight of the delivered bike – it weighs 140 lbs. The bike itself weighs 121 lbs. you may need two people to move the bike to where you want to assemble it and have someone hold it in place while you add the stabilizer bars. The bike doesn’t come with a console. 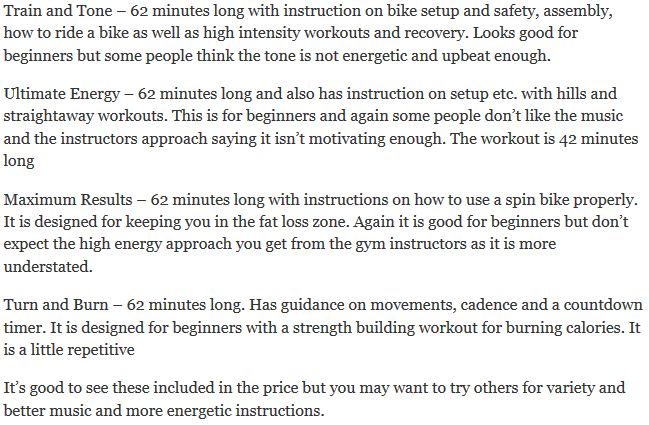 This isn’t unusual for spin bikes and those that do come with tend to be basic. I like to have a console but not everyone needs or likes to have one. They can determine their cadence and how hard they are working without it. I’m not like that I want help by being able to seeing cadence, speed and distance at least – to keep me on track within a workout and be able to compare from one to the other. Spinner does have consoles that fit the bike but they are sold separately. They range in price from $70 to $100 and measure cadence, speed, time, distance, calories and heart rate (depending on model). It doesn’t store or allow you to upload your results so that does need to be done manually. It is possible to fit bike computers to spin bikes but they do require modification, in particular the spoke magnet to make it fit on the flywheel. The bike does come with more accessories than most spin bikes (just). It has a dual water bottle holder located between the handlebars putting them in great position to get hold of them when you need it. They are big enough to fit just about any size bottle. Bottles are held in place by gravity making it easy to grab and put them back without having to slowdown your pedaling. The extra accessories to most other spin bikes are 4 spinning DVDs and a guide which are great for beginners. Heavy flywheel for a fluid natural pedal stroke. Customer reviews are overall mixed but there is more to this than it being a poor bike. The negative reviews are more to do with the shipping that is used rather than the bike itself. It seems the packaging and/or shipping company weren’t up to the job initially. A more recent review does mention the same problem but is very pleased with the bike giving it a 5 stars – their first bike was damaged but the replacement was received in excellent condition. This is a strong solid bike that is durable. It has dual sided pedals and a heavy weighted bike. It is made to be used for tough workouts for a number of years with low maintenance. The Spinner Aero has a good solid construction that can stand up to the rigors of hard and intense workouts over a number of years. It is suitable for serious cyclists and spinner. It can be used bt beginner too. For beginners it has DVDs and guide book to help with bike set up and workouts. The adjustability of the makes it so it can be used by a range of different sizes making it something the whole family can used for low impact cardio workouts. The biggest issue is that it doesn’t include a console to monitor workouts but this is something many spin bikes don’t have. That aside this is a good bike to get your bike training and workouts in the comfort of your home.